This October as part of the NFL International Series, Atlanta Falcons will head to London to host Detroit Lions. The game will take place at Wembley Stadium on Sunday 26 October, with gates opening from 11:30am and the game kicking off at 1:30pm. Instead of the usual tailgate parties around the fan zone at Wembley, from 9:30am there will be an ‘NFL Sunday Brunch’. For those of you who are making a weekend of it in London, head to Trafalgar Square on Saturday 25 October for the NFL fan rally between 12pm and 4pm. The rally is a chance for all NFL fans to get together as well as have the opportunity to see cheerleaders, past and current team players. It’s free to attend and a great afternoon out. This will be my first NFL game so I’m quite excited to explore the fan rally and experience my first game – As a neutral, I’m hoping for a Lions win, but more so, I’m hoping we get to see Calvin Johnson aka Megatron in action. If anyone has any other tips or ‘must do’ things whilst NFL fans are in London for the weekend, feel free to tweet me @NFLGirlUK or by commenting below. 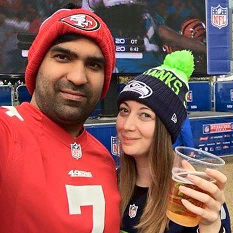 Nice blog young lady – it’s good to get more female fans into what many deem a macho sport – hope you can turn some more your female brethren – especially in the UK – into NFL fans!